Whether used within a corporation or college campus, recreational area, shopping center or transportation system, Call Boxes provide a swift and reliable way for employees, visitors and customers to communicate to a monitoring station. Two-way based Call Boxes, designed by Connectivity, allow for integration into most existing radio systems and provide direct access to personnel connected to the system. Connectivity’s design allows for expansion of security coverage and can help improve response time without the need for additional personnel. Call Boxes provide an affordable and reliable way to communicate with and secure the most remote locations. Not only can Connectivity’s Call Boxes integrate into most existing two-way radio systems, but they are also upgradeable should a user’s radio frequency change. Built-in voice chips give audible instructions to users requiring assistance, and each unit has an automatic Call Box ID and location identifier so responding personnel can provide aid. Motorola Call Boxes allow for integration into most existing radio systems and provides direct access to personnel connected to the system. Allows for expansion of security coverage and can help improve response time without the need for additional personnel. Includes a voice instruction message for the user, automatic call box ID and user location identifiers, a courtesy light, easy push-to-talk operation, a silent tamper alert broadcast to security, low battery alert, 40-day standby battery capacity, one 12-volt, 12 amp/hour rechargeable battery, call box keys and tamper resistant screw bits. Just opening the Call Box door or pressing the button on models without a door will enable instant, reliable notification (ID and location) to one individual or to a team of security and emergency personnel. Automatic audible instructions help guide users...step-by-step. And crystal-clear, two-way voice or voice and visual communication enables responding personnel to quickly assess the user's needs. Vandalism has been addressed with a tamper-alert, which will only be heard by designated staff when triggered. Input and output connectors are accessible for expansion peripherals such as lights, camera, motion, smoke, gas, water detection devices and gate entry. Patrons at resorts, golf, tennis, theme parks and other recreational areas can enjoy the convenience of a callbox to place drink, lunch and sundries orders or to make dinner reservations at a clubhouse. The "hands free" unit is the perfect communications solution for restaurants without drive up windows. This systems narrow frame and portability make placing a callbox in a strategic location or parking space for takeout orders a cinch. The potential for increased revenues and happier patrons makes procuring one of our Call Box systems an easy choice! In the event of a disaster, Call Box portability will allow units to be deployed at a moments notice to command posts of medical, fire/paramedic, security, military and emergency planning and relief agencies. Following a disaster, they can be tactically placed in remote and inaccessible areas as the critical link between people. Features include the ability to quickly change messages to suit temporary language requirements. This Call Box with an aluminum enclosure mounts on a wall, PVC or aluminum stanchion. This solar-powered Call Box comes with a PVC stanchion. This solar-powered Call Box has an aluminum stanchion. This AC/DC-powered Call Box has an aluminum stanchion. This Call Box inlcudes a clear faceplate cover, an activation ringer, an antenna and small reflective decals. 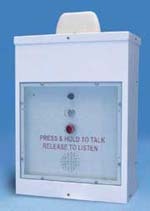 This self-standing Call Box features a clear faceplate cover, an activation ringer, an antenna and reflective decals. This white, powder-coated, aluminum Call Box comes with a standard base stand. This white, powder-coated, aluminum call box is 4 feet tall for indoor uses such as parking facilities and hospitals.